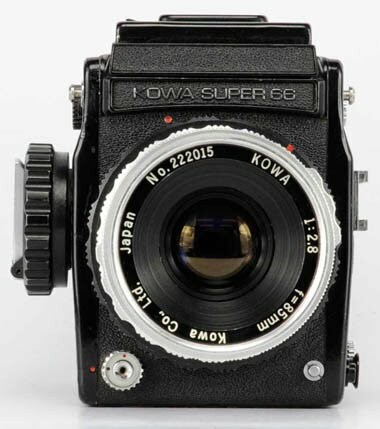 The Kowa Super 66 is a fast-handling 2 1/4'' x 2 1/4'' single-lens reflex camera with modular design, permitting instant interchangeability of magazines, lenses, viewfinders, and focusing screens. Human-engineered operating controls offer maximum simplicity and convenience. Integrated accessory system includes specialized aids for virtually any photographic assignment. Standard 12/24 roll film magazine provides full 2 1/4x 2 1/4'' (56 x 56mm) format, gives 24 exposures with 220 film, 12 exposures with 120 film. Optional 16/32 magazine provides 1 5/8'' x 2 1/4'' (42 x 56mm) format, corresponding most closely to proportions of standard 4x5'', 8x10'' and 16x20'' enlargements; provides 32 exposures on 220 film, 16 exposures on 120. Polaroid (tm) magazine provides 8 2 1/4 x 2 1/4 exposures on standard pack type Polaroid (tm) film. Perhaps nowhere is the almost incredible versatility of the Kowa Super 66 system so dramatically revealed as in the realm of interchangeable lenses. Reflecting the innovative skills acquired over decades of practical experience making sophisticated optical systems for industrial, medical/scientific, video, and motion-picture applications, Kowa engineers have created an integrated system consisting of ten automatic lenses from 19mm to 500mm. Four wide angle lenses are available: a remarkable 19mm f/4.5 fisheye (by far the widest focal length offered for 2 1/4'' x 2 1/4'' cameras); a 35mm f/4.5; a 40mm f/4.0; and a compact, relatively fast 55mm f/3.5. Standard lens is an 85mm f/2.8 incorporating air spacing to optimize performance. The Kowa 110mm f/5.6 macro lens allows direct helical focusing to 31 inches from film plane, and is computed for maximum flatness of field and edge-to-edge resolution. Four Kowa telephoto lenses presently exist; an unusually compact, lightweight 150mm f/3.5; a superbly resolving 200mm f/4.5; a still compact 250mm f/5.6; and a space conquering 500mm f/8 (which becomes an automatic 1000mm lens in conjunction with the Kowa optical image magnifier). Each Kowa lens features a fully automatic diaphragm always at maximum aperture except for the actual exposure; a convenient preview lever allows depth-of-field examination at any time. A welcome advantage in literally scores of applications is the precision ten-speed Seiko leaf shutter. This reliable, between-the-lens metal shutter offers speeds from 1 to 1/500 second plus 'T', with full synchronization for electronic or conventional flash of any kind at any speed. Parallel, equidistant shutter and aperture controls permit simultaneous changes in lens opening and shutter speed, while retaining same exposure value; yet, either control is individually adjustable at any time. Integral 10-second self timer assures maximum stability in macro/micro and ultra telephoto applications, by closing down diaphragm and raising mirror and light shield at the beginning of operational cycle. Offering greater reliability, accuracy, and synchronization capability than cloth shutter types, these precision Seiko shutters represent still another significant advantage of the Kowa Super 66 system. For ultimate protection, each Kowa Super 66 lens (except standard lens) is supplied with a custom carrying case. Kowa Super 66 offers logical, 'human-engineered' operating controls to optimize handling speed. The extra large Transport Knob contains a fold out handle, and advances film, winds shutter, positions mirror and light shield, and counts exposures in a fast 1 1/3 turn. (A built-in ratchet mechanism allows any desired number of shorter strokes as well). Oversize, distinctively finished shutter and aperture controls allow fast, accurate selection of desired settings. Aperture rings have full and intermediate click stops for precise aperture selection. Distance, depth of field, shutter, and aperture settins are all located in the same position, and are all visible at a glance... a vitally important feature in professional work. An automatic magazine/body interlock prevents blank frames and unwanted double exposures yet, by simply moving the multiple-exposure switch (equipped with a safety lock), any desired number of exposures may be superimposed on a single fram without removal of back or other time-consuming operations. The shutter release is threaded for standard cable releases, and contains a lock to prevent unintentional exposures. Loading all Kowa interchangeable film magazines is exceptionally rapid, as the magazine need not be removed from the body unless desired. When loading, simply aligning two arrows on the film leader positions the film for automatic 'stop' at the first frame, and all succeeding frames (when advanced) as well. Large, positive locking controls allow instant removal of lens, viewfinder, focusing screen, and magazine when desired. For maximum security, Kowa grips, flash brackets, and tripod mounts screw into the threaded accessory shoe on the camera side. 11-Speed Seiko Leaf Shutter. Speeds include T, 1, 2, 4, 8, 15, 30, 60, 125, 250 and 500. This shutter allows full M/X synchronization at all speeds; a screw-lock PC terminal prevents accidental cord removal. The "V" position activates a 10-seco nd self-timer; when used, the timer raises the camera's reflex mirror and internal light shield at the beginning of the operational cycle to effectively preclude possible vibration. Extended Helical Focusing Mount. Permits focusing from close-up to infinity without accessories. Parallel/Aperture/Shutter Control. Enables simultaneous adjustment of both controls without altering actual exposure value. 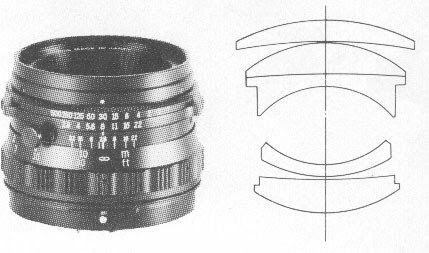 ''Concentric'' Lens/Shutter Controls. The lens aperture, shutter speed, distance scales, depth-of-field information, and infra-red focusing indices are all visible from above the lens. Each lens is supplied in satin black finish, and may be used interchangeably on all Kowa Super 66, Six MM, and Six models. 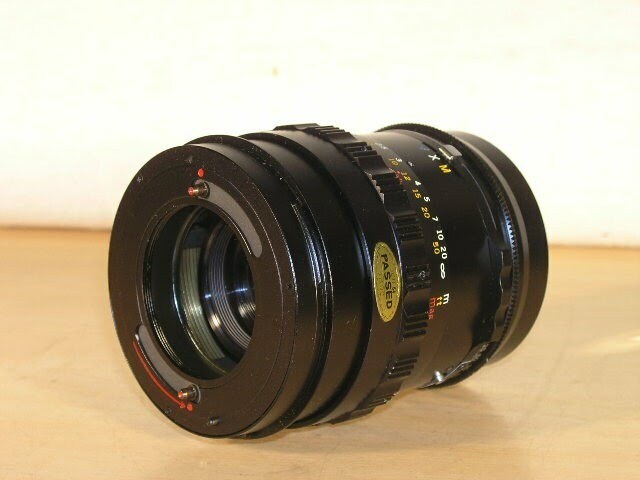 Additionally, the Kowa 110mm Macro lens is supplied complete with carrying case. Kowa 85mm f/2.8 Automatic Standard Lens (Cat. No. 661-258). Perhaps the most versatile of all Kowa Super 66 lenses, this 5-element formula incorporates air-spacing to optimize contrast and resolution throughout the aperture range. The maximum apert ure of f/2.8 increases focusing speed and accuracy, particularly in dim light. Continuous helical focusing from 29.0'' to infinity permits direct magnifications to 0.2X (1/5th life size) without accessories. Weighing only 17.5 oz., the Kowa 85mm f/2.8 Aut omatic standard lens offers genuinely impressive optical performance combined with ultimate handling speed and convenience. Kowa 110mm f/5.6 Automatic Macro Lens (Cat. No. 661-260). 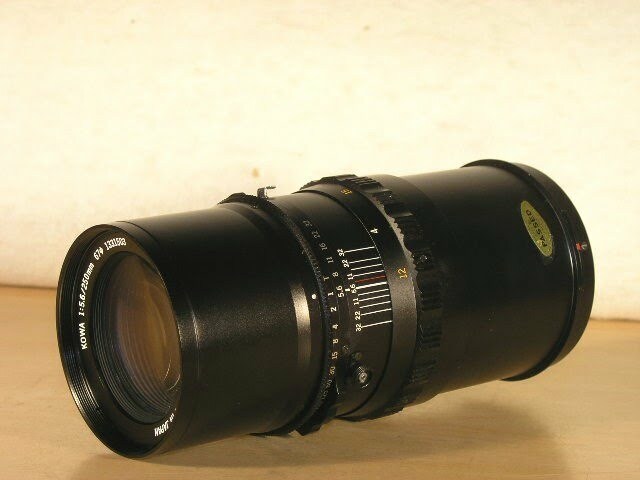 An historic ''first'' in 2 1/4 SLR optics, this 6-element lens offers the convenience of an integral helical focusing mount calibrated directly in magnification ratios from 0.03X to 0.2X (1/ 5th life size). 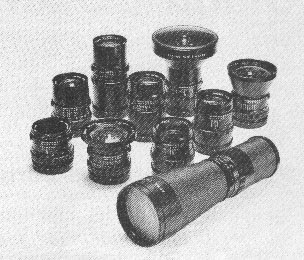 Used with Kowa automatic extension tubes T1 (75mm depth) and T3 (16mm depth), magnifications to 1X (life-size) are obtained; alternatively, when used in the Kowa Auto Bellows (Cat. No. 663-424), magnifications from 0.74X to 2.2X may be sel ected. The optical design of the lens incorporates air-spacing, and provides superior resolution, flatness of field, and image contrast in close-up photography as compared to standard, wide-angle, or telephoto lenses at equivalent magnifications. A superb choice for copying, medical and dental photography, photomacrography, industrial and scientific photography ... wherever maximum resolution and detail are paramount in close-up photography. Weight 17.5 oz. 24 oz. Each Kowa Telephoto lens is supplied complete with carrying case in satin black finish, and may be used interchangeably on all Kowa Super 66, Six MM, and Six models. Catalog number 661-262, combines relatively fast speed with exceptional compactness (3.3'' long) and light weight (24.0 oz). Image magnification is 1.77X compared to 85mm standard lens. The extended helical mount allows focusing from 55.5'' to infinity fr om the film plane, providing a magnification ratio of approximately 0.13X (1/8 life size) without accessories. Widely preferred for professional portraiture, as the greater camera-to-subject distance shows true, natural perspective as well as enabling the photographer to work at a comfortable distance from the subject. May be carried in Kowa Everready Case with Kowa Front Extension Cover (cat. No. 663-366). Catalog number 661-264, providing more than 2.3X magnification compared to the 85mm standard lens, this compact telephoto lens delivers excellent resolution and contrast throughout the entire diagonal of the image area. At the minimum focusing distance of 96.0'', a magnification ratio of 0.1X (1/10th life size) is achieved. Accepting standard Kowa 67mm filters, this compact ''true'' telephoto is a superb instrument for sports and action photography as well as portraiture. Catalog number 661-226. Only 5.6'' long, this 6-element telephoto produces images almost 3X larger than the standard 85mm lens, yet accepts standard 67mm screw-in filters and lens accessories. 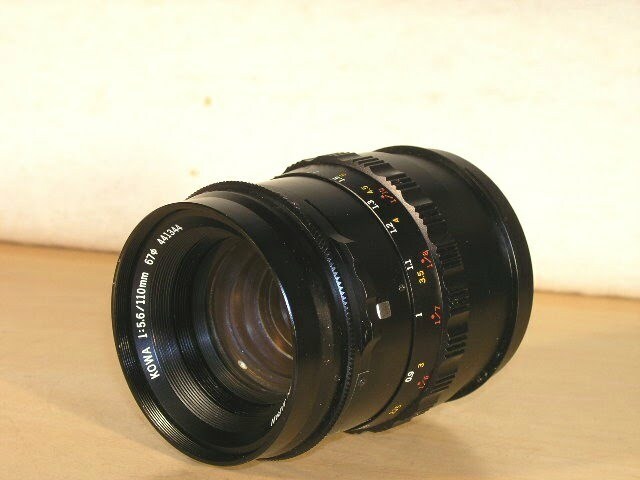 This lens may be used in conjunction with the Kowa telephoto l ens support (Cat. No. 663-360) for added convenience when the tripod is mounted. The apparent compression of distance makes the 250mm a useful tool for varying the appearance of common-place objects in relation to their surroundings. An excellent choice where convenient hand-held operation is required in a powerful telephoto lens. Catalog number 661-268. Brings the most distant objects nearly six times closer! This powerful ''true'' telephoto consists of 7 elements in 6 groups, and focuses to 26.0 feet... here, the image size equals that achieved with standard 85mm lens at 54 inche s. Despite the magnification, the Kowa 500mm f/8.0 automatic telephoto lens is a hand-holdable 12.6'' long, and is an invaluable instrument for ultra-distant subjects in sports, news, wildlife, and surveillance work. This lens accepts Kowa 95mm screw-in f ilters and is supplied with lens hood and a special lens support for added stability. Note: The effective focal length and magnification factor of Kowa 150mm, 200mm, 250mm, and 500mm automatic lenses may be doubled by use of the Kowa Optical Image Magnifier (Cat. No. 661-285). 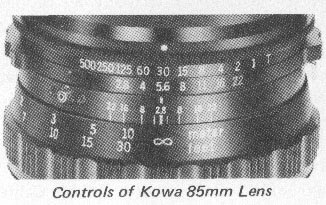 This 6-element instrument retains the original focusing range of each lens, while doubling the effective focal length, it is described fully in 'Kowa Super 66 Lens Accessories'' section. Length 3.3 in. 4.5 in. 5.6 in. 12.6 in. Diameter 3.2 in. 3.2 in. 3.2 in. 4.1 in. Weight 24 oz. 29 oz. 28 oz. 69 oz. (Cat. No. 663-353). An invaluable aid to fast, positive focusing. The Kowa Rapid Focusing Handle is designed to attach to the focusing ring of all Kowa Super 66 lenses, and is securely locked in place by means of a metal locking screw. 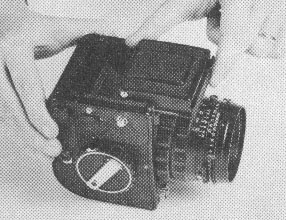 When attached, the photographer simply grasps the large plastic focusing handle and moves it; as the handle is moved, the helical focusing mount of the lens turns simultaneously. This accessory is particularly useful for sports, news, and wildlife photography, and in fact p ermits quick focusing even when wearing gloves. One of the most practical of all Kowa accessories. Kowa Lens Holder for 250mm lens offers extra stability and support; threaded for tripod mounting. Supplied with Kowa 19mm fisheye and 500mm ultra-telephoto lenses; optional for 250mm or other lenses. Cat. No. 663-360. Kowa Lens Hoods provide extra protection against flare, and are constructed of lightweight metal. There are four basic types: custom for 55mm f/3.5 lens; basic for 110mm, 150mm and 200mm; for 250mm; and a convenient folding rubber type for the 85mm standard lens. cat. Nos: for 55mm f/3.5, 663-405; folding type for 85mm, 663-402; for 110mm/150mm/200mm, 663-406; for 250mm lens, 663-403. (Cat. No. 661-285). This compact optical instrument doubles image size of Kowa telephoto lenses, in effect producing a lens of twice the rated focal length. The Optical Image magnifier is attached to the Kowa camera body exactly like a lens; the Kowa tele photo lens is then mounted directly on the Image magnifier. It is specifically computed for optimum performance when used with the Kowa 500mm f/8.0 automatic telephoto lens, which becomes in effect an automatic 1000mm f/16 lens when the Image Magnifier is employed. Yet, excellent definition is obtained with the Image Magnifier when used with Kowa 150mm f/3.5, 200mm f/4.5, and 250mm f/5.6 automatic telephoto lenses as well. Kowa Optical Image Magnifier provides effective 1000mm focal length with 500mm lens, 500mm focal length with 250mm lens. 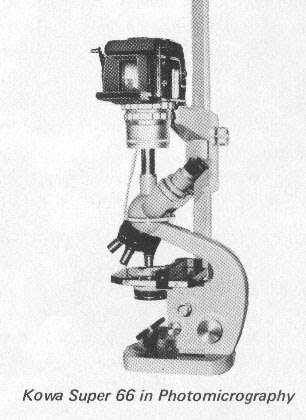 This highly sophisticated optical 'module' receives and magnifies the image transmitted by the master lens, projecting it onto the film plane with a magnification factor of 2:1 - twice original size. Retains all automatic camera and lens control couplings including fully automatic diaphragm operation. 4-element construction incorporating rare earth elements for optimum color correction throughout visible spectrum. Regardless of the lens in use, the minimum focusing distance of the master lens is retained. At the minimum focus position, the effective magnification ratio is doubled, as shown in the chart below. Optically, the Kowa automatic Optical Image Magnifier is composed of six elements, ground, polished, and hard-coated for maximum light transmission as with all Kowa Super 66 lenses. 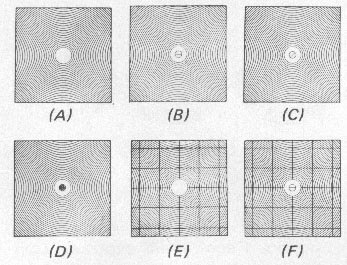 Image contrast, resolution, and freedom from flare and chromatic aberrati on are thus significantly enhanced compared to conventional optical converters. The longer lens-to-film distance occasioned by the magnifier requires an exposure factor of 4X, which may be applied to film or shutter speed or, if preferred, compensated for by opening the master lens by two f/numbers when the magnifier is used. When u sed with either Kowa TTL meter/finder, which measure light at a position equivalent to the film plane, no exposure compensation is required. A significant innovation in interchangeable magazine concepts, Kowa Super 66 film magazines require no dark slide. An automatic light shield protects film from exposure when either lens or magazine is removed. Magazine removal takes place in seconds. Equally beneficial, the L-shaped film path, unique among roll film magazines, avoids excessive film 'buckling' and stress during rapid transport, as well as eliminating the tendency for roll film to curl and 'set' when left in the magazine for extended intervals. Each Kowa roll film magazine accepts both 120 and 220 roll film through an easily made movement of pressure plate and exposure counter controls. Loading of magazines may be done on or off camera. Each magazine incorporates a film type reminder slot, accepting standard 120/220 roll film carton end tabs, as well as a highly legible exposure counter. An automatic interlock prevents advancing film if shutter has not been fired. For instant preview of lighting and perspective, Kowa's Polaroid (tm) magazine accepts standard Polaroid type 105, 107 and 108 film packs providing 8 2 1/4'' x 2 1/4'' exposures in color, black and white, or on B/W Print/Negative film - a decisive benefit to professional photographers. (Cat. No. 662-301). This all-purpose 2 1/4'' x 2 1/4'' (56mm x 56mm) magazine is supplied as standard equipment on Kowa Super 66 cameras. It may be used interchangeably for 120 (12 exposures) of 220 (24 exposure) roll films through a simple reversal of the pressure plate and one-time setting of the integral exposure counter. Any desired number of multiple exposures may be made without removal of the magazine or any other operation save movement of a spring-loaded switch on the camera body. The L-shaped film path of this magazine substantially increases film flatness, a vital requirement of professional photography. In addition, the traditional tendency of roll film to ''set'' or curl when left in the magazine for extended periods is complet ely eliminated. Both ''feed'' and take-up spools are easily positioned by the large, conveniently-shaped exterior grips which may be locked in ''extended'' position during film loading. During operation, the film runs upward with the feed spool at the bot tom and the take-up spool at the top of the magazine. A metal slot is provided for insertion of the film-carton end, thus providing a positive reminder that the magazine is loaded as well as indicating the film type. This magazine weighs 18.2 oz., and is supplied with protective front cover when individually ordered. (Cat. No. 662-302). This highly practical magazine provides 16 exposures on 120 roll film and 32 on 220 film. The frame size is 1 5/8'' x 2 1/4'' (42mm x 56mm), corresponding most closely to the proportions of standard 8x10'' and 16x20'' enlargements. An important application of the 16/32 magazine is the ease with which it is usable for ''superslides'' or 1 5/8'' x 1 5/8'' transparencies mounted in standard 2'' x 2 '' slidemounts. 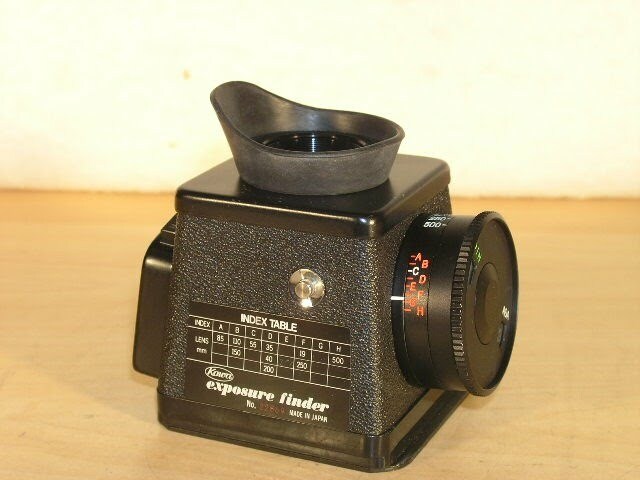 Many processors will return slides in this standard mount size on reque st; alternatively, the square (1 5/8'' x 1 5/8'') aperture slidemounts are readily available from photo dealers for mounting by the photographer. 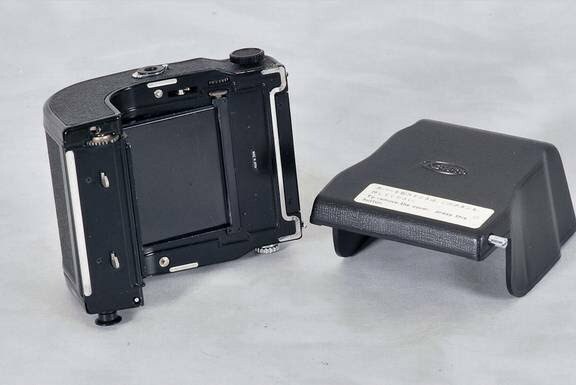 In operation, the photographer simply positions a 1 5/8'' x 1 5/8'' (127 size) slidemount on the focusing screen, and composes within that area; alternatively, the screen may be marked for the appropriate area with a grease pencil to indicate the usable field. This procedure enables use of universally available 2'' x 2'' slide projectors normally used for 35mm slides, with the added benefit of a total projected image area nearly twice as large as 35mm transparencies. 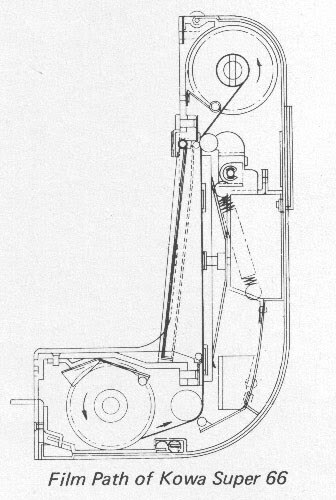 The construction, operation, and other features of this magazine are identical to the Kowa 12/24 magazine as described above. (Cat. No. 662-303). An important addition to the Kowa system of 2 1/4 photography, this lightweight magazine accepts standard Polaroid type 105 (black and white print/negative) or 108 (color print) film packs, each yielding 8 2 1/4'' x 2 1/4'' exposures. Each Polaroid film type is rated at ASA 75; thus, exposures for ASA 100 film may be precisely ''previewed'' through the simple method of allowing one half-stop additional exposure as compared to ASA 100 film. (Use of Polaroid Type 107, ASA 3000 film packs is not recommended). Under normal temperatures, development time is 60 seconds for color film and only 30 seconds for black and white print/negative film; if required, the negative may be retained for further use through a simple fixing process. As the f ilm develops outside the camera, a second or third 'test' exposure may be taken while one or more exposures are developing. This magazine also incorporates the unique Kowa Automatic light Shield, and may be attached or removed regardless of the number of frames exposed. It offers tremendous advantages in studio, advertising, fashion, and technical photography... wherever absol ute assurance of correct composition, perspective, and exposure are required. Seven precision Kowa viewfinder options allow individual selection of finder best suited to photographer and subject. The standard focusing hood opens and closes with convenient one hand touch. The built-in magnifier accepts six optional diopter inserts for maximum viewing/focusing accuracy. 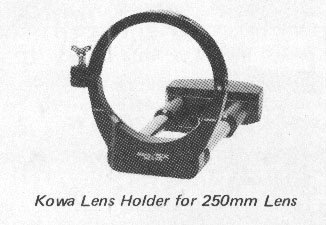 Kowa Critical Magnifier provides complete shield against extraneous light, includes convenient folding rubber eyecup. This finder, long favored for studio work, enables continuous diopter selection from -4 to +3. Two Kowa pentaprism viewfinders offer an unreversed, laterally correct eye level image at either a 45 degree or 90 degree angle, depending on model selected. Of particular benefit to available light workers are the two Kowa Meter/Finder options; a 45 degree viewing angle pentaprism and a chest level Critical Magnifier. Both Meter/Finders allow TTL readings, either at open or stop-down aperture, and offer the remarkably wide sensitivity range of 32,768:1 (EV 2-17 with ASA 100 film). The Kowa Sportfinder is an excellent aid to news and action photography, permitting both eyes open eye level viewing for 55mm, 85mm, and 150mm lenses with an accurate parallax correction control. Easily interchanged within moments, these precision viewfinder systems further enhance the intrinsic ability of the Kowa Super 66 camera to tailor itself to specialized individual requirements becoming, in effect, an extension of the photographer's eye. Two Kowa Super 66 TTL meter/finders bring extra speed and accuracy to exposure measurement with Kowa Super 66 cameras. Each incorporates sensitive CdS sensors which measure the light passing through the lens through a simple match-needle operation. Each Meter/Finder may be used either for open-aperture or taking-aperture measurement as desired. The Kowa Super 66 45degree prism TTL Meter/Finder (Catalog number 663-318) provides an upright, laterally correct image through a brilliant coated pentaprism, making this Meter/Finder exceptionally valuable for sports and action photography as well as technical applications such as photomacrography or photomicrography in which the convenience of a 45 degree viewing angle is desirable. 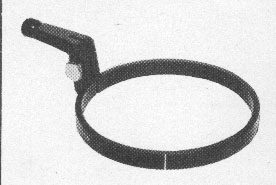 The magnification is 0.73X with the 85mm standard lens; a -1 Diopter magnifying eyepiece is supplied, and may if desired be replaced by any of seven alternative eyepiece lenses from -4 Diopters to +3 Diopters. Two CdS sensors provide an integrated light measurement with principle weight accorded to the central image area. The Kowa Super 66 Critical Focusing TTL Meter/Finder (Catalog number 663-316) provides identical TTL metering accuracy with straight-thru ''Chest Level'' viewing a welcome convenience in candid work or photography with a tripod mounted camera. The magnification is 1X with 85mm standard lens; four CdS sensors provide an integrated light measurement with principle emphasis accorded the central image area. A focusing -2 Diopter eyepiece is permanently installed; a soft folding rubber eyecup protects both eye and meter from extraneous light. Meter/Finder is adjusted for the ASA Film Speed in use. A reference mark is aligned with an alphabetical scale corresponding to the focal length and maximum aperture of the Kowa lens in use. Thus ''programmed'', the meter is operated by rotating the control knob until the meter needle is centered within the large ''C'' bracket appearing in the finder. This method permits light measurement at open (maximum) lens aperture. The desired aperture and shutter speed are read from the meter knob scale, and transferred to the camera and lens for picturetaking. Alternatively, taking-aperture (stopdown) meter readings may be employed at any time. Here, the stopdown metering Index Mark is aligned in place of the Lens Reference letter; the lens' depth-of-field preview control is depressed, and the meter needle is centered by adjusting the lens aperture. With this method, no adjustments in meter controls are required when changing lenses. Both TTL Meter/Finders are identical in response and calibration. With 85mm standard lens and ASA 100 film, the measuring range extends from EV 2 (2 seconds at f/2.8) to EV 17 (1/500th sec. at f/16), a ''brightness'' range of 32,768:1. Both TTL Meter/Finders accept ASA filmspeeds from 10 to3200, as well as corresponding DIN equivalents (12-36). Shutter speed readouts are from 30 seconds to 1/500th second; lens openings from f/2.8 to f/45 are indicated, enabling both finders to operate perfectly with all Kowa Automatic lenses from 19mm to 500mm. A single 1.3v mercury battery (Everyready 625, mallory RM-645 or equivalent) powers each TTL meter/finder. A push-button battery-test circuit centers the meter needle when the battery is at full strength. A sliding On/Off Switch assures continuous meter response as well as preventing battery depletion when not in use. Each Kowa TTL Meter/Finder is constructed from light-alloy metals, with easily-seen red and black calibrations on the Control Knob. A protective rubber eyecup, bottom cover plate, and mercury battery are supplied with each meter. Dimensions...45 degree Prism Meter/finder; 3.6'' x 3.6'' x 4.9'' (including eyecup); critical focusing meter/finder; 2.8'' x 3.5'' x 3.6'' (including eyecup). Weights...45 degree Prism Meter/Finder, 16.2 oz. ; Critical Focusing Meter/Finder, 7.1 oz. Six individual focusing screen types bring even greater versatility to Kowa Super 66 owners The Plain Matte (A) screen provides brilliant, accurate focusing with standard and telephoto lenses. The optional Horizontal Split-Image (B) screen simplifies focusing with wide angle lenses, and for many users with lenses of other focal lengths, particularly in dim light. Alternatively, the Diagonal Split-Image (C) screen is often preferred when subject does not include pronounced vertical material. The Microprism screen (D) is especially valuable with medium and long focal length lenses, and delineates the point of optimum sharpness more decisively than matte screens. For architectural, copy, and creative multiple exposure work, two Kowa screens are supplied with engraved reference lines at 11mm intervals; one with plain matte center spot (E) and one with horizontal split-image rangefinder (F). All Kowa Super 66 screens are easily interchanged in seconds. Kowa Flash Bracket attaches rigidly to camera with two point support (tripod socket and accessory shoe) for maximum stability even with heavy professional flash units. Accepts standard Honeywell or Graflex Quick-Release clamps, Cat. No. 663-357. Locking PC Cord has right angle, parallel blade plug for virtually all flashes. Screws into PC Terminal. Coiled, extends to 60'', with molded strain relief design for maximum reliability. Cat No. 760-214. 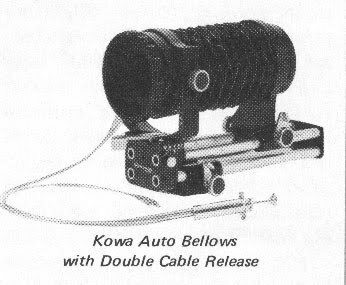 Kowa Auto Bellows with Double Cable Release provides continuously variable extensions from 1X (life-size) to 3X with 85mm lens, 0.7X - 2X with 110mm macro lens. Independent front and rear standard focusing controls with positive locks. Focusing rail permits moving entire assembly for critical focusing at predetermined magnifications. Front standard allows vertical tilt (20 degrees front or back), 15mm rise/fall. Double Cable Release (supplied) maintains automatic diaphragm operation irrespective of extension. Cat. No. 663-424. 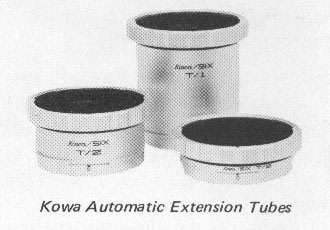 Kowa Automatic Extension Tubes are available in three lengths: 75mm (Type T1), 32mm (Type T2), and 16mm (Type T3). Tubes may be used individually or in any combination of two. 75mm tube (Model T1) provides 1X (life-size) magnification with 85mm lens, 0.9X magnification with 110mm macro lens. Retains fully automatic diaphragm control Cat. Nos. Type T1, 663-420; Type T2, 663-421; Type T3, 663-422. 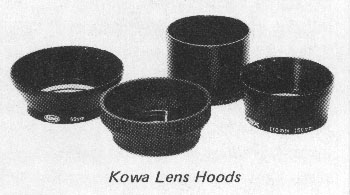 Kowa Closeup Lenses Nos. 1, 2, and 3 may be used with all lenses accepting 67mm screw-in accessories, either individually or in any combination. 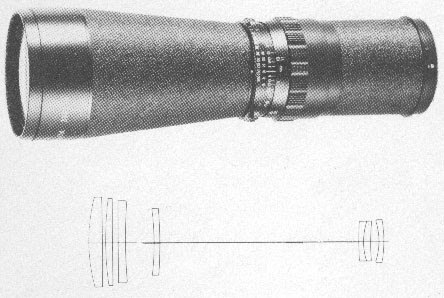 Magnification range with 85mm lens; 0.32x with No. 1, 0.23X with No. 2, 0.19X with No. 3. Coated optical glass construction. Requires no exposure compensation. Cat. Nos. : No. 1, 663-426; No. 2, 663-427; No. 3, 663-428. Kowa Microscope Adapter with shutter permits photomicrography to unlimited magnifications with any standard microscope (25mm diameter tube). May be used with or without ocular of microscope. 10-Speed Seiko leaf shutter allows precise speed control. Cat. No. 663-359. Kowa Adjustable Hand Grip/Release allows stepless selection of grip angle, permits trigger action shutter control. With security strap. Cat. No. 663-352. Kowa Quik-Load Tripod Mount permits interchange of film or magazine on any size tripod platform. Cat. No. 663-358. Kowa neckstrap molded of tough, durable vinyl material; bayonet mount safety hooks with positive locks. Cat. No. 663-355. Kowa Carrying Case offers valuable protection for camera with folding hood and 85mm or 110mm lens attached. Hinged front section for quick access. Cat. No. 663-365. Note: With the exception of the Kowa Magazines, Focusing screens and Tripod Mount, all Kowa lenses and accessories may be used on previous Kowa 2 1/4'' x 2 1/4'' camera models.